Lack of adequate infrastructure and access to services exacerbate poor living conditions for slums residents. Photo of David Berkowitz. World Bank released a new study reaffirming the challenges climate change and natural hazards pose to the urban poor. Titled “Climate Change, Disaster Risk, and the Urban Poor,” the report was prepared in time to be presented at the C40 Sao Paulo Summit. According to World Bank estimates, there are currently 6.775 billion people living in this world, of which half live in urban areas. 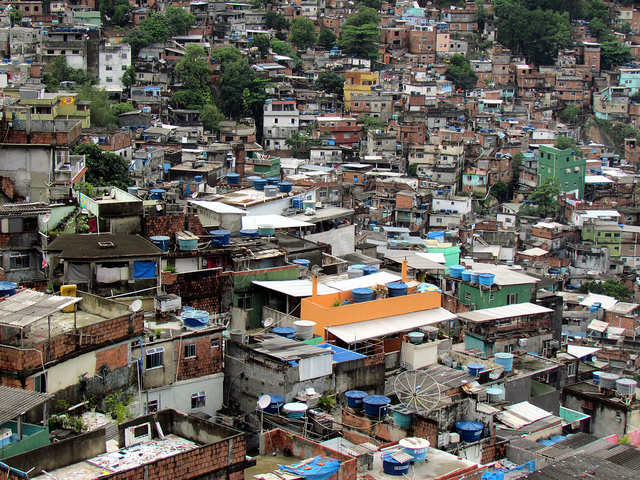 Furthermore, merely 1 billion people, almost 30 percent of the urban population, live in slums in developing countries. Urban poor are especially vulnerable to the risk of disasters due to lack of adequate infrastructure and access to services, unsafe housing, insufficient nutrition and poor health—all further exacerbated by densely populated informal housing and treacherous terrain. The conditions that deteriorate the quality of life for the urban poor can turn “a natural hazard or change in climate into a disaster, and result in the loss of basic services, damage or destruction to homes, loss of livelihoods, malnutrition, disease, disability, and loss of life,” World Bank’s Urban Development team adds. Of course, the most important factor of all is financial support to deliver services and upgrade infrastructure. “Local governments need to leverage existing and new resources to meet the shortfalls in service delivery and basic infrastructure adaptation,” the report adds. As recommendations, the study provides the following five broad actions to help build resilience for those at greatest risk in urban areas, each one requiring the commitment and collaboration of local governments, communities, national and international institutions. Assessing risk at the city and community level: Understanding hazards, socioeconomic, and institutional risks to developing adaptation and disaster risk reduction plans. Integrating climate change and disaster risk reduction policies for the poor into urban planning and management: Creating proactive policies that provide affordable sites for low income residents and regulating land tenure to spawn investments and encourage infrastructure investments. Building institutional capacity to deliver basic services and reduce vulnerability to climate and disaster risk. Opening new finance opportunities for cities to address climate adaptation and disaster risk reduction, like climate funds, but, the World Banks adds, “bulk of investments will come from targeted government expenditures. The study was prepared for The Mayor’s Task Force on Climate Change, Disaster Risk and the Urban Poor, an initiative launched by Zoellick and the mayors of Dar es Salaam, Jakarta, Mexico City, and Sao Paulo at the 2009 UN Climate Summit in Copenhagen. The Mayor’s Task Force works to better understand the intertwining issues of climate change, poverty and disasters in order to identify good practice examples and propose policy and investment programs. Ashoka Changemakers: Vote Now for Solutions to Sustainable Urban Housing!